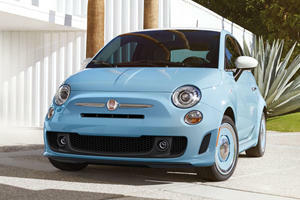 The 2017 Fiat 500c is fitted with a 101 hp, 97 lb-ft 1.4-liter engine. Front-wheel drive and a 5-speed manual transmission is standard and a 6-speed automatic is an option. Performance levels and interior space is not particularly impressive but you do get a decent amount of kit for your money and even the base Pop trim comes with keyless entry, heated power exterior mirrors and rear parking sensors. 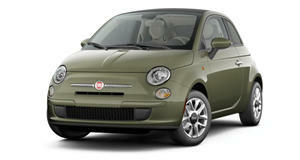 The Fiat 500c is the convertible version of this popular little subcompact city car. Sharing much of its running gear with the hatchback models, the 500c adds a folding fabric roof that enhances the fun factor without compromising on practicality levels too much. 2017 sees some changes to the engine lineup as well as an increase in the base equipment levels. The cute exterior styling is translated well into the cabin, while most competitors feature bland and functional dashboards and door cards, the 500c has bespoke switchgear and a funky painted metal dash. Not all materials are quite as high quality as you might expect but then this is after all a budget city car and it is a very pleasant place to be. The small dimensions mean that while front occupants can get comfortable, rear passengers will be squeezed in to the tiny back seats unless they happen to be young children. Even the driver and front passenger will quite likely be rubbing elbows if they are larger than average. The folding fabric roof slides back into a semi-messy pile above the trunk which means that storage space is only slightly less than in the hatchback (which is still rather small) although it blocks the view directly behind you when down. The B and C pillars remain in place so the 500c is not quite a full open-top car, think of it rather as offering a massive retractable panoramic roof. There is a lot of fun to be had zooting about in the 500c, it turns in and handles rather well. Stick to the standard diameter wheels and the ride is a lot better than you would expect from such a diminutive little city car. There is a fair amount of body roll but the little Fiat clings to the road and its fizzy nature works best with the manual transmission. Once you get on the highway things start to unravel, the lack of any real power means that overtaking maneuvers can be adrenaline filled for all the wrong reasons. The tiny dimensions also do not respond well to side winds, interior noise levels are not too obtrusive though. 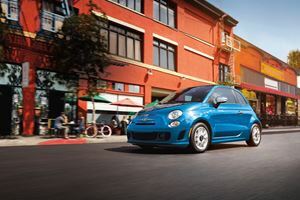 The Fiat 500c models are equipped with a 1.4-liter inline-4 engine producing 101 horsepower and 97 lb-ft of torque, the more powerful 160hp turbocharged motor which was available previously is now limited to Abarth trims only. Front-wheel drive and a 5-speed manual transmission are standard, a 6-speed automatic transmission is an option. There is not much performance to be had from the little motor and while it is adequate for town driving duties, you will soon be jumping up and down in your seat willing the little car on as you attempt to merge onto the highway. The slightly more expensive and larger Mini Cooper Convertible offers a more rounded level of performance although the 500c offers better consumption levels with 31mpg in the city and 38 mpg on the highway. There are two trim levels on offer for 2017 with the base 1.4-liter engine, there is an Abarth variant too but that is covered in a separate review. The base Pop trim offers 15-inch alloy wheels, 5-inch touchscreen, 6-speaker audio system, premium cloth bucket seats, keyless entry, heated power exterior mirrors, leather-wrapped steering wheel with audio controls, folding rear seats and rear parking sensors. Lounge trim adds heated front seats, leather trim, chrome exterior mirrors, automatic temperature control, additional exterior colors, and a rear park assist system. A Popular Equipment Package incorporating climate control and an auto-dimming rearview mirror and Sport Appearance Package are also available. 16-inch alloys and a number of visual improvements are available as individual upgrades depending on the trim level. A navigation system, premium Beats audio system and all-weather packages can be specified too. The Fiat 500c is a unique offering in its segment, the retro design and overriding focus on style appeals to many shoppers even after a number of years on the market. The only real downside is a lack of power on these non-Abarth models although there is a lot to like about the diminutive dimensions and high level of standard equipment and customizability options. 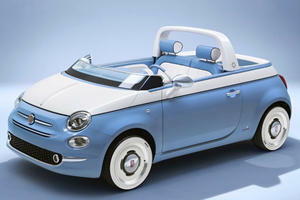 And Lapo will build you one too, if you ask nicely.